Yesterday Harri "Hapa" Seppi (right) flew125 km, from Jämi to Loimaa; adding another long flight to this very good XC season! Hapa told me he flew on his own Ozone Addict R, and that conditions would have allowed for an out-and-return or triangle flight, but that he just continued going straight South without really considering alternatives. He experienced cold, bladder pressure and sickness, and flew the last section in a kind of trance but was very happy with this new personal best and join the crowd of 100+ km pilots! 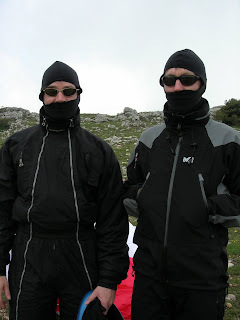 The picture is from Gourdon in May 2006, just before Hapa and myself were going to test fly the then new Ozone Addict R.